i recently went over to wicker park to try out prasino, whose website describes it as "an eco-chic neighborhood restaurant." like sable kitchen & bar, they know what a vegan is and include several vegan items on their menu. we started off with the hummus. it was good, basic hummus. 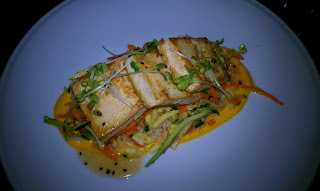 for my main dish, i opted for the miso glazed tofu with brown rice, julienned vegetables and ginger carrot sauce. i'm a big tofu girl, so i really enjoyed this. when josh and i were at sable (which was actually after my trip to prasino), i realized that chef heather terhune's sauce and zucchini and carrot salad on the crispy red lentil cake reminded me a lot of the sauce and julienned carrots and zucchini on my tofu at prasino... the dishes were so different though, it was interesting that both worked so incredibly well. i didn't have any of their specialty drinks... so i can't speak to any of their "craft beers, sustainable wines, small-batch spirits, and fresh juices" ... but i would certainly try prasino again.